The Four Artists: Ufuk Gueray, Verne Harrison, Franke James, and Reel Youth. 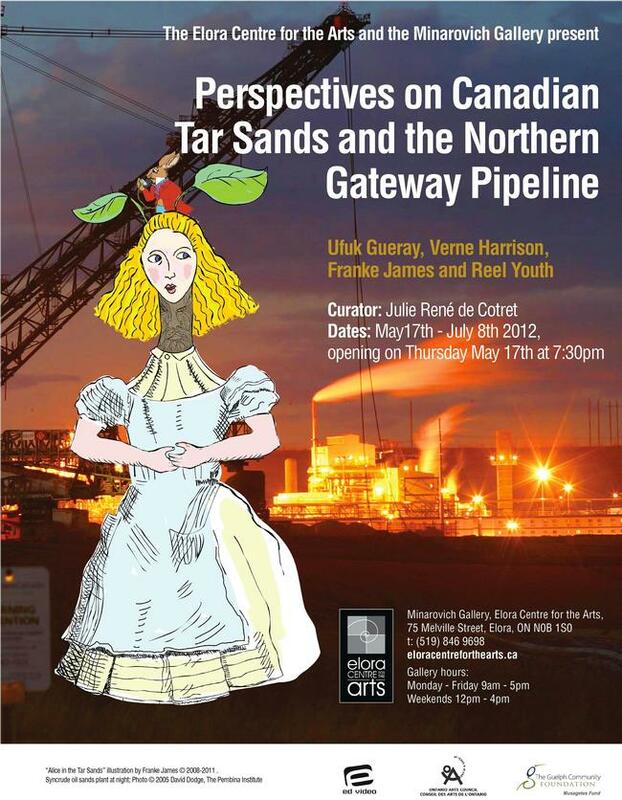 “Perspectives on the Canadian Tar Sands and the Northern Gateway Pipeline” is incredibly timely. It’s fascinating that this art show is happening now — against the backdrop of our Minister of Natural Resources, Joe Oliver, calling anyone who objects to the pipeline a “radical“! So this is the perfect stuff to make great art about! We have a party in power that is determined to develop the Tar Sands — no matter what the cost. We have environmentalists who want to defend the people, planet, and future generations. And First Nations whose voices in opposition to the pipeline are getting stronger. It’s a must-see show. – Good points, entertaining, awesome, cool and very interesting. – Trees help us breathe. – Very sad about the oil spills. – Terrific presentation. This is a call to hit the street, I will get involved! – I love everything about nature. – This is outrageous, how could the government do this to us? – More solar, less oil. – The art has volume and can really speak to people like the anarchy in society now. – Youth need to protect the Spirit Bear. – You have declared war. It’s not on humans. You don’t like nature. – How did you get here? Bike? Walk? Horse? At least it’s ethical. – What I love about Canada.. the wildlife, the rivers, the gardens. I love nature. – The environment keeps us grounded as industrialists, once they destroy the environment what will hold them back? They’ll then have the power to go limitless until they dig the world from all resources. And there will be no going back. – What is happening to environmental protection under the Harper government is criminal. We will be set back 50 years and indeed may never recover. GOOD EXHIBIT! – I am very inspired. Art is a great way of spreading awareness and standing up for this amazing cause. I’d love to help!